I recently got involved with Cooking Matters, a program run through Gleaners Food Bank, teaching participants about nutrition and what it means to eat and live healthfully. On top of nutrition education, each class includes a cooking demo (hands down the most DELICIOUS part of the class!) where a chef teaches class participants basic knife skills and cooking techniques as well as fun facts about the foods we are preparing that day. If you love people, have an interest in nutrition, and live in Southeastern Michigan, I would highly suggest that you sign up to help teach a class! (And no, you don’t need to be a nutrition professional to teach! They give you the lesson plan in advance to guide you.) Definitely a good time and extremely rewarding, too. One of my favorite Cooking Matters lessons is the grocery store tour – where we go to a local grocery store and give suggestions for navigating through the twists and turns of those looming Meijer aisles. I thought I’d share with y’all some tips we share with the participants, along with my own suggestions that I’ve come up with to help give you the most nutritional bang for your buck. 1. Make a list! Check it twice! AND STICK TO IT. When we don’t make a list, we make more impulse buys. AKA buy foods we don’t need, are not healthful, and end up spending more money. 2. Stick to the perimeter. Think about how grocery stores are usually set up. We’ve got the produce, dairy products, bread, and meats around the perimeter. And what about the middle aisles? Cereals, cookies, chips, sodas, frozen meals, and all of those colorful boxes and cans that claim there’s a balanced meal inside, waiting for you! Now, there are some decent canned and frozen foods out there (this can be a blog post unto itself), for sure, but the majority of the middle aisles will be processed foods – things we want to eat in moderation. 3. Buy in bulk, but only if you’re going to use it. Stocking up like the end of the world is near seems appealing. Most of the time, however, the extra food just goes bad and is thrown away. And think of it this way: those are your dollars being thrown away! Produce that keeps well for a long time are root vegetables like potatoes, carrots, and beets; and fruits with skins like apples, oranges, and pears. Fruits and vegetables that have a higher water content, like berries, peppers, and zucchini, can be frozen for later. Try the freezing technique found in this post here. Just make sure to use your frozen produce within 6 months so you can enjoy them to their yummiest potential and without freezer burn. On another note, bread (and other bread products like bagels, English muffins, and tortillas) can also be frozen! When I first starting living off-campus during college, my friends definitely did a double take when they saw my loaves of bread in the freezer. But who wants moldy bread, especially when you can’t eat it fast enough and your non-air conditioned student housing has bananas ripening and bread molding within 2 days?! So just pop the entire loaf of bread in the freezer and take out the number of slices you want when the moods hits you. Just be sure to zap ’em in the microwave first for a few seconds to defrost. 4. Pre-packaged foods = more $$$. Buying bagged lettuce may be an easy option, but you are also paying more money to have the dirty work done for you. If you are looking to save a few dollars, try cutting up your own fruits and veggies instead of ones that are already chopped up for you. Don’t think you’ll have time to peel and chop carrots into carrot sticks? Try this: Prep all of your produce right when you get home from the grocery store. Then when you want it during a hectic day, it is ready for you! Also, did you know that the more “convenient” the food and the more it is handled – think pre-packaged lettuce mixes, bagged spinach, and baby carrots – the more of a concern food borne illness becomes? I’m not saying that your bagged lettuce contains E. coli, but as the convenience factor of a food increases, so does the risk of a contaminant coming into contact with the food. 5. Don’t get stuck in the middle, high and low is where to go! Remember this saying when you frequent the center aisles where the more processed foods live. 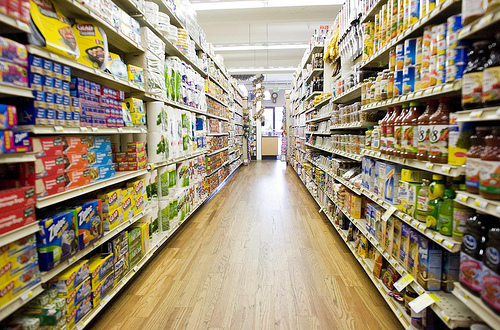 Did you know that manufacturers pay the grocery store more money to have their product placed on the middle shelf? It’s a pretty intelligent tactic to help increase sales, mostly because the middle shelf is at eye level for….kids! This is especially true in the cereal aisle. Cereals found on the middle shelf often have more sugar, cost more, and have less fiber than a cereal found on the top or bottom shelf. Check it out the next time you’re in the cereal aisle! Also, when choosing a breakfast cereal, find one with a good source of fiber, which is 3 or more grams per serving. It’s the battle of the century. Who will prevail? Also, consider buying bagged cereals. They’re a bottom shelf cereal, and you might be surprised by their top-notch taste! 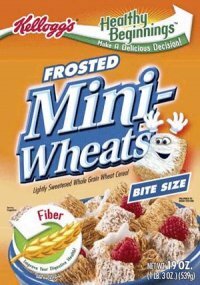 If it’s hard to believe that Frosted Mini Spooners are equitable to Kellogg’s Frosted Mini Wheats, give the ingredients list and nutrition facts a glance. They might be more similar than you originally thought. Do you have any of your own tips for navigating the grocery store jungle? I’d love to hear ’em! This entry was posted in Uncategorized and tagged Cooking Matters, Gleaners Food Bank, shopping tips by missdietitian. Bookmark the permalink. It's a good trick, isn't it? 🙂 No one wants moldy bread! Yes! Also a very good tip! 🙂 And pack lettuce/tomato in a separate tupperware container and then top on your defrosted sandwich once you're ready to eat.